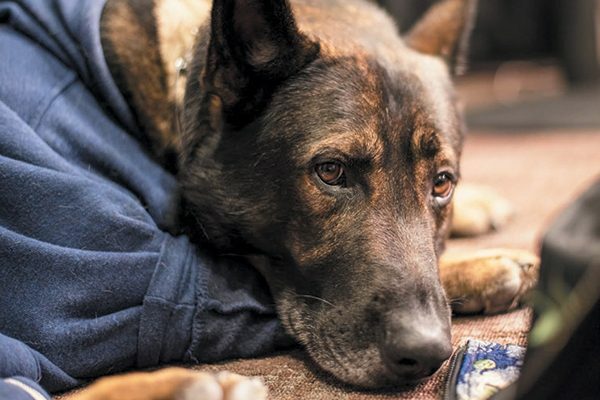 When country singer RaeLynn climbs aboard her tour bus, the Type 1 diabetic knows she can count on her German Shepherd Dog to protect her from low blood sugar — and lonely nights. “Jazz has been a lifesaver in so many ways,” the 23-year-old Texas native tells Dogster. RaeLynn and Jazz the dog. Photography courtesy RaeLynn. His musical name isn’t what you’d expect to see on the tag of a dog whose human opened for Blake Shelton, but according to RaeLynn, 5-year-old Jazz welcomes a little improvisation and lives up to his moniker. “Jazz is pretty laid-back; he kind of goes with the flow,” she explains. The “WildHorse” singer — who shot to fame as a contestant on The Voice in 2012 — brought Jazz home one year ago, just as her husband, Joshua Davis, embarked on a military career that would see the couple separated for months at a time. It was also love at first sight. RaeLynn recalls feeling an immediate connection with Jazz, which was thankfully reciprocated. The trainer wanted to make sure Jazz wanted RaeLynn as much as she wanted him, and not only did Jazz fall for RaeLynn but for Joshua and Dolly as well. “He probably loves my husband more than he loves me,” says the singer, who adds that she didn’t expect Jazz to click with his new Chihuahua sibling quite as much as he does. She recalls an enthusiastic reunion between the two dogs after a particularly busy month of touring saw Dolly take a break from the road at RaeLynn’s mom’s house. Jazz accompanies RaeLynn on tour. Photography courtesy RaeLynn. Dolly shares a bunk with Jazz on the tour bus, but she’s not the only one who likes sleeping with him. RaeLynn describes Jazz as a comforting, nearly human-sized teddy bear whose one fault is following and (accidentally) tripping her if she gets up for a late-night bathroom break. It’s no accident that he’s also trained to get up if the singer’s blood sugar drops. The first time that happened, Jazz alerted her so early RaeLynn didn’t realize what was happening. While Jazz does accompany RaeLynn to songwriting sessions, he takes a break when she performs for crowds. The singer says Jazz gets nervous when she’s onstage, so he chills out in the bus or the green room while she’s singing. RaeLynn takes extra care to monitor her blood sugar before leaving Jazz to take the stage and feels better knowing he’s with her when the bus pulls out after a performance. RaeLynn and her family. Photography courtesy RaeLynn. After finding fame as a teen on the second season of The Voice, RaeLynn spent years working on her first studio album, WildHorse, which debuted at No. 1 on Billboard’s Top Country Albums chart in 2017. The singer co-wrote all but one of the songs on the record, including the LP’s first single, “Love Triangle.” The emotional lyrics tell a story of divorce from a child’s perspective and were inspired by the singer’s own childhood. Fan favorite “Lonely Call” is the second single from the record, released in the summer of 2017. Autobiographical like its predecessor,”Lonely Call” was prompted by the end of a romance in the age of smartphones. The breakup ballad has a real-life happy ending, as the man who inspired it is now RaeLynn’s husband. Heather Marcoux is a freelance writer and country music fan. Her dogs, GhostBuster and Marshmallow, are on Instagram as @ghostpets. Heather is on Twitter at @HeatherMarcoux. 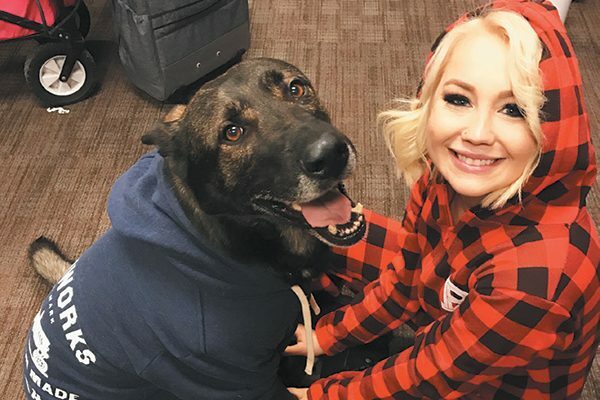 The post Meet the Dog Who Helps Country Star RaeLynn Manage Her Diabetes appeared first on Dogster.